Comes Wiltes, Magnus Magister Hospitii Domini Regis. HODIE 3a vice lecta est Billa, for the ordering of Ecclesiastical Ministers, que communi omnium Procerum Assensu conclusa est, dissentientibus Episcopis Dunelmen. Carliolen. Wigorn. Cicestren. et Westm. Eodem die, 3a vice lecta est Billa, touching the retaining of Journeymen, que communi omnium Procerum Assenfu conclusa est. Eodem die, 3a vice lecta est Billa, for the City of Chestre, touching Wears in the River of Dee, que communi omnium Procerum Assensu conclusa est. Eodem die, 3a vice lecta est Billa, for the abolishing and putting away of sundry Books and Images, que conclusa est, dissentientibus Comite Derbie. Episcopis Dunelmen. Coven. et Lichef. Carliolen. Wigorn. Westm. et Cicestren. et Dominis Morley, Stourton, Wyndesor, et Wharton. Prima, For barreling of Butter and Cheese, in divers Counties, que 1a et 2a vice lecta est. 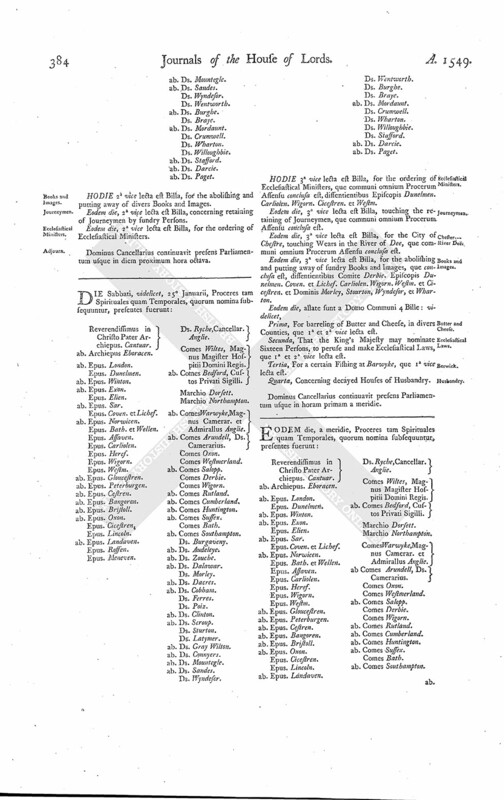 Secunda, That the King's Majesty may nominate Sixteen Persons, to peruse and make Ecclesiastical Laws, que 1a et 2a vice lecta est. Tertia, For a certain Fishing at Barwyke, que 1a vice lecta est. Quarta, Concerning decayed Houses of Husbandry. Comes Warwyke, Magnus Camerar. et Admirallus Anglie. Prima, for the abolishing and putting away of divers Books and Images. Exped. Secunda, concerning the City of Chestre, for Wears in the River of Dee. Exped. Tertia, touching the disinheriting of William West, attempting the poisoning of the Lord Laware, que 1a vice lecta est. 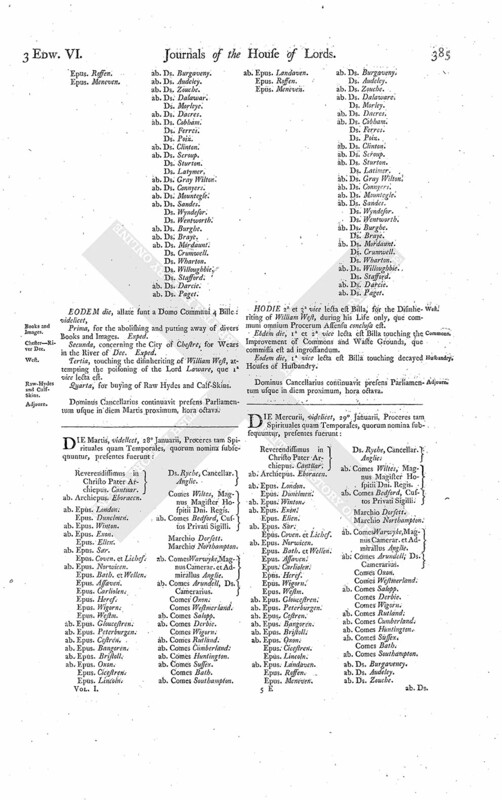 Quarta, for buying of Raw Hydes and Calf-Skins. Dominus Cancellarius continuavit presens Parliamentum usque in diem Martis proximum, hora octava.